Apple & bananas are great first food for babies as both are less allergenic, rich in nutrients and has smooth texture. The apple banana puree tastes so delicious as the combination of apples and bananas complement each other perfectly!It is perfect for babies from 6 months after introducing apple puree and banana puree separately as individual purees. 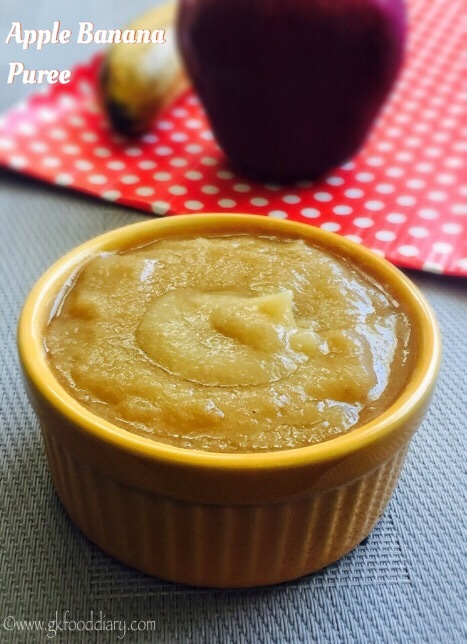 Babies surely love this mix of apple banana puree for its natural sweetness. 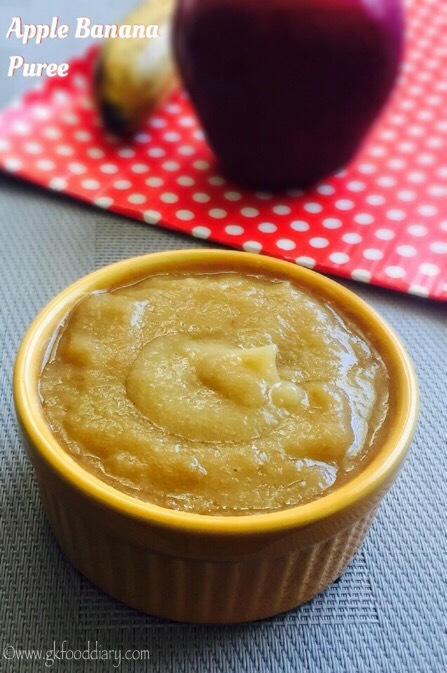 For toddlers, you can add this apple banana puree to any porridge’s or breakfast cereal as a sweetener! 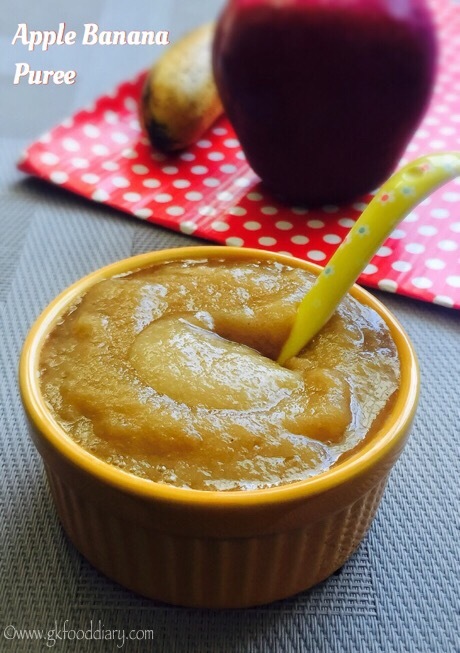 Let’s check how to make this easy and simple apple banana puree for babies. 2. Once the apples are steamed, it will be soft and transparent. 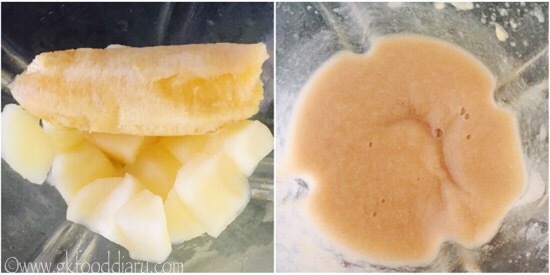 Now blend it with peeled banana, little water to a smooth paste in a blender. You can also use breastmilk/formula instead of water to get the desired consistency. 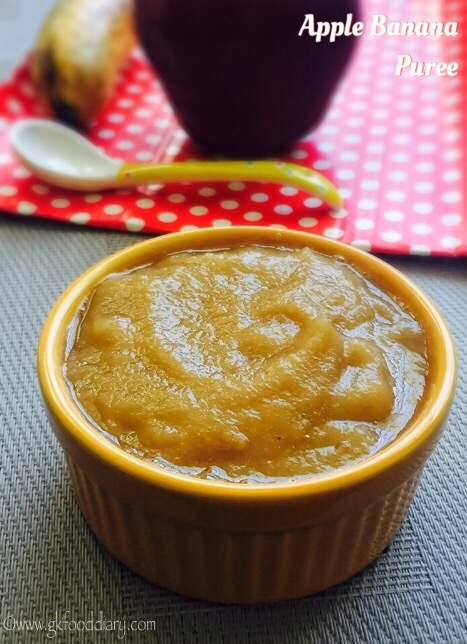 Healthy and tasty apple banana puree is ready to feed your baby. 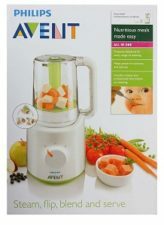 Try this puree with Red delicious & gala apple variety if your baby like more sweet taste. 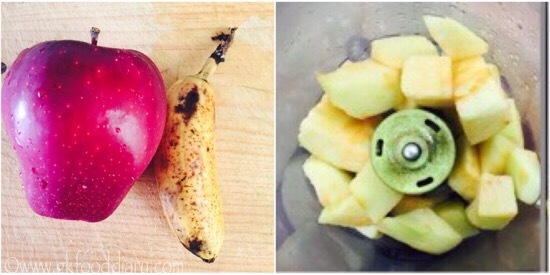 You can mash it with fork instead of blending the apple and bananas. Generally apple /banana doesn’t cause any allergies, but check for symptoms and stop feeding your baby if you find any. Steaming is a healthy option for baby food than pressure cooking. So I prefer steaming using a Idli pot or steamer.